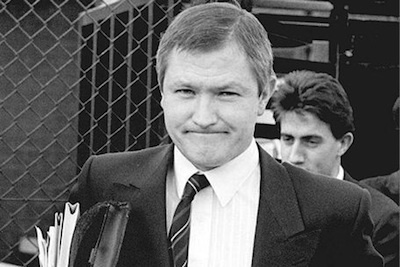 Most of the 500-page review of the 1989 murder of Belfast defence lawyer Pat Finucane released this week has been heavily censored “in the interests of state security”, the Finucane family has been told. Some of the documents have been so heavily edited that they have been rendered completely unreadable. Mr Finucane’s widow Geraldine said the family had been given no chance to examine the documents themselves, and the report by British barrister Desmond de Silva was a “sham”. “The report doesn’t tell me much more than previous inquiries,” she said. The heavily redacted pages include copies of documents from the British army’s shadowy Force Research Unit, the Stevens II investigation and Special Branch and British Home Office documentation. Little of what was revealed has not been made public before, although the report still had the potential to shock -- particularly in the British political establishment, which had hitherto largely ignored the collusion between loyalist killers and British forces in the North of Ireland. One statistic summed up the level of collusion, in that 85% of the intelligence received by the loyalist paramilitary UDA in the late 70’s came via the British Crown forces; and that in an 18-month period in the late 80’s, there were 279 “leaks” to the organisation. Central to the collusion was British army agent Brian Nelson, who became the intelligence chief of the west Belfast UDA and organised the murder of Mr Finucane. He is believed to have been involved in at least 15 murders and probably many more and scores of attempted killings. It emerged from the de Silva report that days after the assassination, leading members of the west Belfast UDA met in a Shankill Road social club to discuss killing two more top Catholic lawyers, Oliver Kelly and Patrick (PJ) McGrory. An RUC report of intelligence dated February 17, five days after Mr Finucane was murdered in front of his wife and children, contains information of plans to attack the two men by the very same death squad. Next to Mr McGrory’s name on the printed British document are the handwritten words “PIRA/INLA solicitor”. Comments made under Mr Kelly’s name have been blacked out by censors. It is clear both men were lucky to have avoided Mr Finucane’s fate. * How Nelson was allowed to carry out the Finucane assassination and other deadly attacks without objection or interference from his handlers. * How Ken Barrett was himself recruited as a British state agent in 1991, and how his briefing to the RUC on the Finucane killing was recorded but the tape “disappeared”. * How after the murder, the British Army and the RUC continued to give “highly misleading” information on Nelson and his activities to British officials and prosecutors. It was confirmed in the report that information provided by Nelson could have prevented attacks on the life of Sinn Fein’s Alex Maskey in the late 1980s, including one in which he was wounded and another in which he escaped a murder bid by just 20 seconds. One detail which emerged is that at attack against Sinn Fein leader Gerry Adams was prevented and another cancelled in 1987, ironically thanks to Nelson’s efforts. One intelligence report author said he feared at the time that the Force Research Unit, a murderous offshoot of MI5, was pushing for Mr Adams’s murder. It was confirmed that information passed to the Crown forces could have saved the life of west Belfast man Gerard Slane, who was killed by the UDA colleagues of Nelson in 1988. Teresa Slane said PSNI chief Matt Baggott owed it to her family to “correct the injustices of the past” and bring members of the Shankill UDA before the courts. Mrs Slane said the de Silva made for difficult reading. “Some of the details I was aware of but it was difficult seeing it in black and white,” she said. “We know now that the British government and security forces, which are meant to uphold the law, could have prevented Gerard’s murder. Despite providing solid confirming a good deal of information about collusion which is already in the public domain, the family of Mr Finucane dismissed the British barrister’s report. At a press conference, his widow Geraldine described it as “a sham... a whitewash... a confidence trick”. She told journalists in London: “This report is not the truth.” and renewed her call for a full public inquiry. She said the British government had suppressed the truth and attempted to put all blame on dead individuals and disbanded organisations while exonerating ministers, serving officers and existing security agencies. “Yet another British government has engineered a suppression of the truth behind the murder of my husband, Pat Finucane,” Mrs Finucane said. Examinations of the de Silva report by journalists has raised more questions than answers as they struggle through page after page of blacked out paragraphs. Journalist Ed Moloney has insisted that, contrary to the report, the threat to Mr Finucane had been documented by the Dublin and London governments months before his assassination. Sinn Fein President Gerry Adams said he has written to the Taoiseach Enda Kenny urging him to “initiate an extensive examination” of all relevant documents to identify those which could assist the Finucane family’s demand for a public inquiry. He said the then Haughey government had been involved in efforts to protect the three threatened lawyers, and that reports of these exchanges should be examined. “The Irish government needs to shift into a higher gear in support of the family,” he said. The Sinn Fein leader was also dismissive of the British Prime Minister’s claim that British government ministers were not aware of the extent of Brian Nelson’s role as an agent. “Far from prosecuting Nelson fully and in order to prevent the detail of Nelson’s role as an agent being scrutinised in court [then Attorney General] Patrick Mayhew did a deal with Nelson. The murder charges against Nelson were dropped. “It was agreed that Colonel Gordon Kerr, the head of the Force Research Unit, which ran many of the collusion operations, would give evidence supporting Nelson. “The British Minister of Defence Tom King, who was Secretary of State for the north at the time of the killing of Pat Finucane, provided a letter of commendation for Nelson. “And the British Prime Minister John Major held a meeting just before the trial with the north’s Lord Chief Justice Brian Hutton and the trial judge Basil Kelly. In addition, a chapter of the Stevens III Report on collusion, released separately this week under a Freedom of Information request, has revealed that a British Army murder weapon used in the Finucane murder was subsequently returned to the British Army (by the RUC) and destroyed. Nationalists have demanded that the evident attempt to destroy evidence of murder be properly investigated. eirigi’s Breandan Mac Cionnaith said the de Silva report was “a damning indictment of British state collusion in the murder of Irish citizens”, but that it refused to acknowledge the organised, structured and systemic nature of collusion. “By doing so, it tries unsuccessfully to exculpate those in the highest echelons of the British government and its agencies who sanctioned the use of state-controlled death squads,” he said. The involvement of MI5 in a number of murders was now well known, he added. “However, deliberately hidden from the public eye is the fact that, today, MI5 continues to extend a malign influence in the Six Counties with up to one third of PSNI personnel under its direct control.